Maple rocker with sculpted seat. This maple rocker was built using Scott Morrison’s plans – very comfortable indeed. The seat was sculpted using a home made cnc router equipped with a 1/2” bull nose end mill. Very nice rocker, I admire those that make these projects, master craftsman for sure. dumb question – why are the runners so long and with the slight ‘hook’ ? Nice work, yes Scott has very nice plans keep on making saw dust. Very nice. I especially like the wood choice. You don’t see maple used much on rockers. 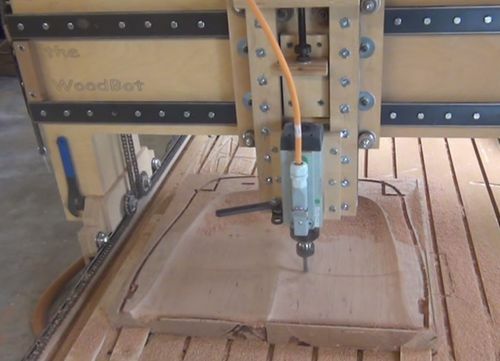 I’d be curious to see a picture or two of your home made CNC machine. I’m considering using either a cove style jig on the table saw or a router set up to sculpt a seat for one of the chairs I’m building. How thick was your seat blank? I really don’t know why the runners are so long other then to prevent tipping back over – or I couldn’t decide where to cut them, I guess we could ask Scott Morrison. I laminated 8/4 maple for the seat blank and used the cnc to face both sides to 1 3/4” before starting to sculpt with the cnc. 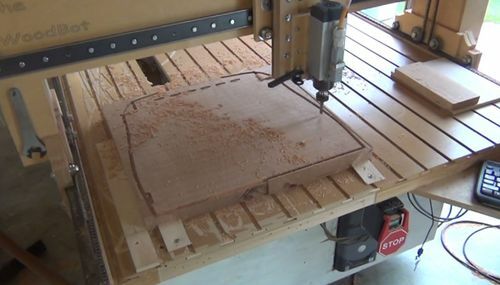 I have built 2 cnc routers, the first one wasn’t pretty but it did the job. The second one which I am using now looks and works great, I am working on a build video for the second cnc. You did a beautiful job on this rocker. It’s a very nice rocker. Wonderful rocker! love the cat. This project has #1 written all over it. Try a spray bottle of water and spritz some on your white background. I will relax the fabric and remove the wrinkles. Good photography is half the presentation. Keep the great projects coming. Thanks, I’ll grab a spray bottle next time, you are right about the photography.